Step in to this Model like unit to find yourself immersed in one of the best floor plans in the development. As you enter the property on the first floor your will find a bright, open, and welcoming great room, which effortlessly lends itself to casual entertaining and everyday living. The warm tones of the concrete tiles floors and custom paint make this home move in ready! Upstairs you will find the master suite complete with private bathroom and a retreat perfect for peaceful reading corner or home office setup. Two additional bedrooms, Full Hall Bathroom with Privacy Door, as well as highly desired Individual Laundry Room complete the Second Level. This unit is conveniently located near the pool in an excellent community. 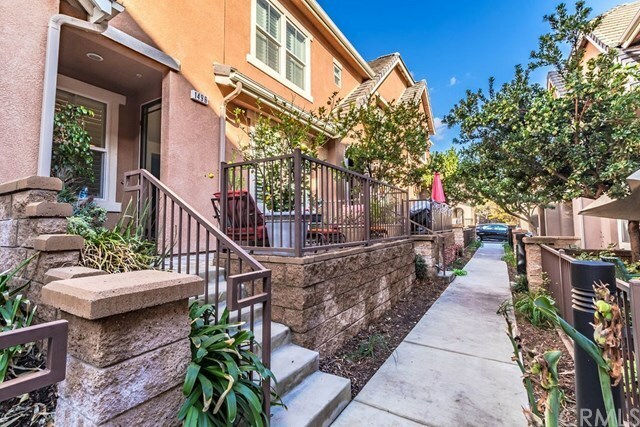 This home is near multiple transportation options including the Metrolink and 10/210 Freeways. This home is located near multiple options for Shopping & Dining as well as excellent schools. HOA Fees include Water, Trash, Exterior Maintenance & Painting, as well as the Common Area Gardening, Pool Spa and BBQ Area Upkeep.